Eaton 3-Pole Thermal magnetic trip unit with MT frame, has voltage rating of 600-Volt AC and current rating of 600-Amps. It has interrupt rating of 65000-Amps at 240-Volt AC, 50000-Amps at 480-Volt AC and 25000-Amps at 600-Volt AC. Magnetic trip unit measures 1.75-Inch x 7.5-Inch x 3.5-Inch. It offers bolt-on mounting. 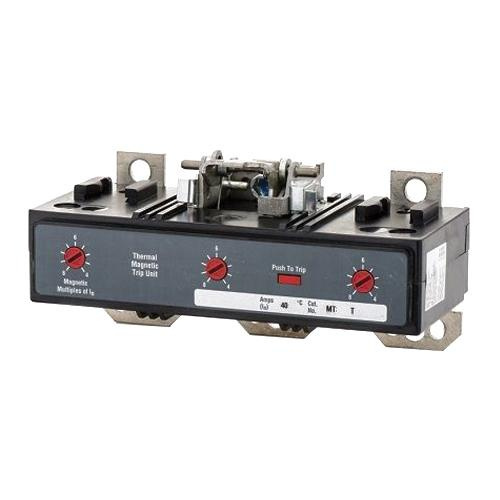 This thermal-magnetic trip unit is suitable for use with type MDL and HMDL thermal-magnetic circuit breakers.